Gases are a state of matter characterized by two properties: their lack of definite volume and their lack of definite shape. This definition suggests, in the first place, that a given mass of gas can occupy any volume whatsoever. Imagine a cylindrical tank filled with a small amount of hydrogen gas placed in a chemistry laboratory. If the top is removed from that tank in a room, the gas escapes from the tank to fill the room. If the door to the room is opened, the gas then escapes to fill the building. If the building door also is opened, the gas escapes into the outside environment and, at least in theory, then expands throughout the universe. Neither solids nor liquids, the other two common forms of matter, display this property. Gases also take the shape of the container in which they are placed. Suppose the valve of the tank of hydrogen gas is fitted with a rubber hose that leads to a cubic box. When the valve is opened, the hydrogen gas fills the cubic box. Its shape changes from cylindrical to cubic. Liquids also take the shape of their container, although solids do not. up of tiny particles that are constantly in motion. In solids, those particles are relatively close together and move relatively slowly. In liquids, they are somewhat farther apart and move more rapidly. In gases, those particles are very far apart and move with much greater speed than in solids or liquids. The rapid speed with which gas particles move explains their tendency to fly away from each other and fill any container in which they are placed. Their relatively great distance from each other explains the other properties of gases explained below. Most of the fundamental laws describing the properties of gases were discovered in the eighteenth and early nineteenth centuries. Those laws deal primarily with three properties of gases: their volume, pressure, and temperature. Direct proportion: A mathematical relationship between two variables such that a change in one produces a corresponding change in the other in the same direction. Gas law: A statement that shows the mathematical relationship of the volume, pressure, and temperature of a gas. Ideal gas: A gas in which the particles of the gas have no effect on each other. Inverse proportion: A mathematical relationship between two variables such that a change in one produces a corresponding change in the other, but in the opposite direction. Kinetic theory of matter: A scientific theory that says that all matter is made up of tiny particles that are constantly in motion. the greater its volume. A relationship of this kind is said to be an inverse proportion. Increasing one variable (such as the pressure) causes a decrease in the other variable. This mathematical relationship between volume and pressure was discovered in 1662 by English chemist Robert Boyle (1627–1691). This relationship is true only if the temperature of the gas remains constant while the pressure is changed. Charles's law. If a balloon is taken from inside a warm house to much cooler air outside, the balloon will appear to collapse. Volume and temperature have a direct relationship to each other. When temperature increases, so does volume; when temperature decreases, so does volume. The mathematical relationship between gas volume and temperature was first derived in 1787 by French physicist Jacques Alexandre Charles (1746–1823). Charles's law is valid only when the pressure on the gas is constant. Gay-Lussac's law. The relationship between temperature and pressure can be observed when pumping up a bicycle or car tire. The tire gets warmer as more air is added to it. The reason for this change is that increasing the pressure on a gas also increases its temperature. This relationship was first expressed mathematically by French chemist Gay-Lussac (1778–1850) around 1802. Again, this law is valid only when the volume of a gas remains constant (as when it's trapped in a tire). The combined gas law. The final gas law—one that shows how volume, pressure, and temperature are related to each other—is called the combined gas law. The value of the gas laws is that one can find any one of the variables, assuming that the others are known. All four of the gas laws previously discussed apply only to ideal gases. An ideal gas is a theoretical concept developed by scientists to learn more about gases. The particles of which an ideal gas is made have no effect on each other. That is, they do not exert gravitational attraction on each other, and they bounce off each other without losing any energy. If one makes these assumptions about gases, it is much easier to develop laws describing their behavior. There is, however, one problem with this concept: there is no such thing as an ideal gas in the real world. All gas particles really do interact with each other in some way or another. That fact doesn't mean that the gas laws are useless. Instead, it warns us that the predictions made by the gas laws may be more or less incorrect. The more or less depends on how closely the gas under consideration resembles an ideal gas. Some gases, like hydrogen and helium, match the description of an ideal gas quite well; other gases do not even come close. 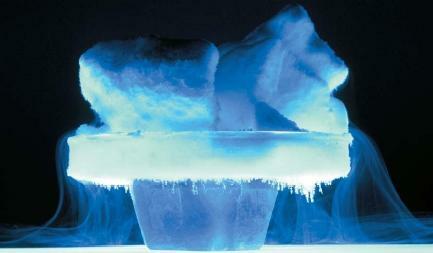 Gases, like other forms of matter, have physical properties such as color, odor, and taste. 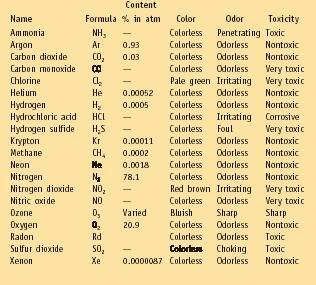 In general, gases tend to be colorless and odorless, although some important exceptions exist. Also, most gases are transparent: that is, it is possible to see objects through them rather clearly. this article has made chemistry extremely easy. thanks a bunch. apparently i have to keep typing untill i reach fifty words.guess i will entirely express my gratatude in a multatude of words, setences and letters. i just want to ask some experiment on expansion of different liquids. I want to know that whether volume of ideal gas is greater than volume of real gas? Can it be said that carbon monoxide gets heavier when temperatures get below freezing? Likewise, would it become lighter as temperatures increase? I know it may seem like dumb questions but just trying to establish if the liklihood of CO gaining entry into buildings via idling automobiles might be impacted by the temperatures the gas is released into. Thanks for your time.